New release : IsGISAXS 2.6 ! IsGISAXS is a software dedicated to the simulation and analysis of Grazing Incidence Small Angle X-Ray Scattering (GISAXS) from nanostructures. The lack of analysis program in this rapid growing field has motivated the development of such a tool. The theoretical treatment needs to combine some notions of "classical" small-angle scattering and diffraction in 2D with the specificity of grazing incidence. IsGISAXS only encompasses the scattering by nanometric sized particles which are buried in a matrix subsurface or supported on a substrate or buried in a thin layer on a substrate. The case of holes is also handled. The geometry is restricted to a plane of particles. The scattering cross section is decomposed in terms of interference function and particle form factor. The emphasis is put on the grazing incidence geometry which induces a "beam refraction effect". The particle form factor is calculated within the Distorted Wave Born Approximation (DWBA), starting as an unperturbed state with sharp interfaces or with the actual perpendicular profile of refraction index. Various kinds of simple geometrical shapes are available with a full account of size and shape distributions in the Decoupling Approximation (DA), in the Local Monodisperse Approximation (LMA) and also in the Size-Spacing Correlation Approximation (SSCA). Both, disordered systems of particles defined by their particle-particle pair correlation function and bidimensional crystal or paracrystal are considered. The aim of this web page is to give a rapid but incomplete overview of the IsGISAXS program. The reader interested by a more formal presentation is advised to have a look at the literature (see references in IsGISAXS manual). using the variable probed depth as function of the incidence angle, X-rays offer the opportunity to characterize buried particles or interfaces. The GISAXS technique is derived from classical small-angle scattering but applied to surface or interface problems. The principle of GISAXS is sketched in Fig. 1. It consists in sending a monochromatic beam of X-rays with a low divergence on the sample surface under grazing incidence. This geometry ensures the surface sensitivity and the probed depth can be adjusted by varying the incidence angle. Any kind of roughness on the surface or any kind of electronic contrast variation in the subsurface region leads to beam scattering in an out-specular direction. In particular, this is the case for islands on a substrate or for buried particles or aggregates. The scattered beam is collected close to the specular beam in the small-angle range in order to probe typical length of the order of a few nanometers (wavelength in the angstrom range). The detector can be punctual, or linear or even bidimensional. In the last case, an image of the reciprocal space close to the origin is obtained as the in-plane and out-of-plane scattering angles are proportional to the corresponding scattering wavevector transfers and thus to the typical distances in the system. A few years ago, GISAXS experiments have started to be performed in situ, in real time, under ultra-high vacuum environment during the epitaxial growth of layers. The availability of high quality GISAXS data with a low-background allows to perform quantitative analysis "far" in the reciprocal space. IsGISAXS is a program dedicated to such simulations and analysis, mainly for nanoparticles. Written in Fortran 90, it runs only under Windows 9x,2000,NT,XP operating systems. It is compiled under Intel Visual Fortran with the SLATEC and PGPLOT libraries statically linked. Its contents is described in the next section with two examples. IsGISAXS can handled the case of disordered bidimensionnal collections of particles described by their pair correlation functions. The island form factor is calculated within the Distorted Wave Born Approximation by taking into account the size distributions which "smooth" the form factor oscillations. Fig. 2 shows typical results obtained for simulation of scattering from Pd islands on MgO(100). In the Decoupling Approximation (DA), a hypothesis of total disorder is made whereas a partial coupling between the size of the particles is introduced in the Local Monodisperse Approximation (LMA). Fig. 2 : Simulation of a GISAXS pattern obtained for a 3nm thick deposit of Pd on MgO(100)@700K. The layer is simulated by a disordered set of cylindrical islands with a log-normal size distributions. The obtained parameters are given in the right panel and compare well with ex situ transmission electron microscopy experiments . In the case of a regular lattice of islands, the interference function is built on scattering rods perpendicular to the substrate surface. The shapes of the rods carries information about the organization of islands and are modulated by the island form factor. Fig. 3 shows that the scattering is very sensitive to the sample orientation; such a phenomenon is well explained by the Ewald construction. Fig. 3 : Calculated GISAXS pattern for a lattice of cylindric islands (R=1nm;H=1nm). 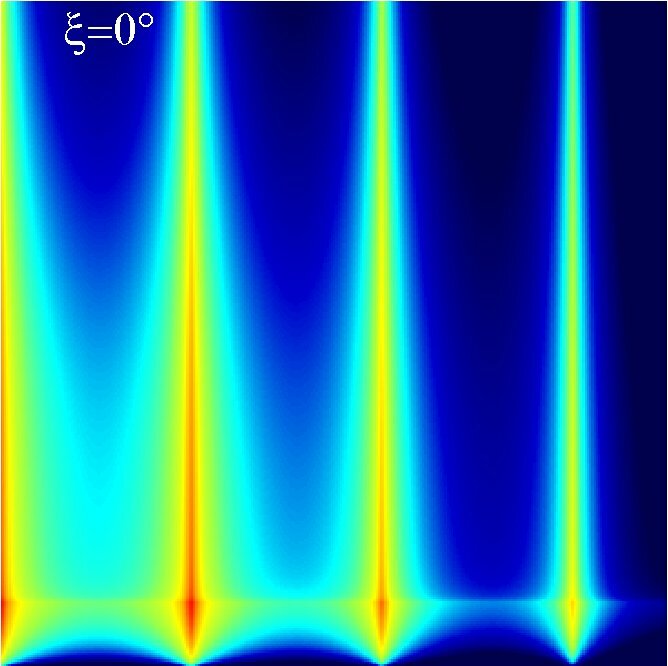 The square lattice L=10nm is characterized by an isotropic correlation length of L=600nm. The X-ray beam is sent either along the lattice cell basis vector (x=0�) or slightly misaligned (x=1.5�). The use of IsGISAXS and the underlying theory is described in depth in the manual furnished with the distribution. Follow the link to see it. pair correlation functions based on the solution of the Percus-Yevick equations in two dimensions with a chosen "interparticle potential"
All the comments and suggestions of improvements are of course welcome. Do not hesitate to contact the author. IsGISAXS is distributed under the GNU public license. The compiled version for Windows 9x,2000,NT,XP and the source codes of IsGISAXS are freely available for non-commercial use, and are provided as-is without any warranty regarding reliability, accuracy and fitness for purpose. The user assumes the entire risk of the use of this program and the author can not be hold responsible of any kind of problems. The author would really appreciate that any publication resulting from this program acknowledges its use by citing the following reference: "IsGISAXS: a program for grazing-incidence small-angle X-ray scattering analysis from supported islands", R. Lazzari, J. Appl. Cryst. 35 (2002) 406-421. The fact of downloading and using the program implies the acceptance of the license agreement. Download the latest version (Windows 9x,2000,NT,XP) of IsGISAXS with the documentation using the following link buttons. Launch the Setup.exe file and follow the installation instructions in the Readme file.